AzhwAr, who was thinking of the danger from iraNiyan (hiraNya kashyap) [in the previous pAsuram] now thinks of the danger from dhuryOdhana’s group. 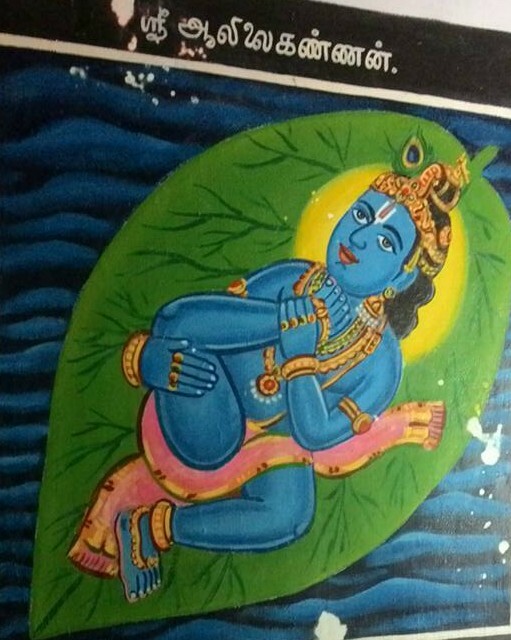 In this pAsuram, AzhwAr is mercifully saying about the viSvarUpam that emperumAn manifested before mahAbhAratha war to bhIshma and others or as an alternative explanation, how he showed to rishi (sage) mArkaNdEya, the worlds that he had swallowed during deluge. It would be appropriate to consider the first two words in this pAsuram “seRRezhundhu thIvizhiththu” together with the incarnation as narasimha in the previous pAsuram or with emperumAn’s act as in this pAsuram. seRRezhundhu thIvizhiththu – getting angry on dhuryOdhana et al who said “your coming here as a messenger is a mistake; pANdavas sending you as a messenger is mistake”, who laid out a false throne for him, who abused vidhura and who carried out contemptuous deeds to emperumAn and his followers, and looking at them with fiery eyes. muRRum maRaiyvaRku kAttiya mAyavanai – the amazing entity [emperumAn] who showed all the worlds to vaidhikas such as bhIshma, dhrONa et al. mAyavanai – this indicates the agatithagatanA Sakthi (the ability to bind entities which cannot be bound) of emperumAn, when he showed inside his mouth, the worlds which are floating in the universe outside. mAyavanai allAl iRaiyEnum eththAdhu en nA – my tongue will not praise anyone other than that amazing benefactor vatathaLasAyi (one who lies on the banyan leaf). Here the reference [to not praising others is not to other dhEvathas, but] is to the other forms of emperumAn such as param (supreme being in SrIvaikuNtam), vyUha (his form in milky ocean) and other vibhava forms (incarnations). en nA – my tongue which is unable to eat because it is not praising emperumAn. en Na EththAdhu – since AzhwAr has said in the 64th pAsuram of this prabandham ‘thirumAlai alladhu dheyvam enrEththEn” (I will not worship anyone other than the consort of SrI mahAlakshmi) he has already confirmed that he will not praise other deities. Hence there is no need for him to convey the same message here. Instead, he is saying that he will not praise other forms of emperumAn [as mentioned above]. ezhundhu – just as a mother throws out a stick that her child is playing with when the child tries to poke itself with that stick, emperumAn, desiring to put an end to the world when he sees the samsAris (dwellers of materialistic realm) utilising the sensory perceptions that he had given them in the wrong ways as this would disable them from harming themselves more and more, gets up angrily. thI vizhiththu – looking at the samsAris with fiery eyes such that they will get annihilated by his mere look, manifesting in his eyes, the anger in his heart, at their improper deeds. maRaiyavaRkuk kAttiya mAyavanani – the amazing emperumAn who showed to mArkaNdEya bhagavAn (great sage mArkaNdEya) all the worlds as they were before [annihilation]. mAyavanai allAl iRaiyEnum EththAdhu en nA – my tongue will not praise anyone other than that amazing benefactor vatathaLasAyi (one who lies on the banyan leaf). Here the reference is to the other forms of emperumAn such as param (supreme being in SrIvaikuNtam), vyUha (his form in milky ocean) and other vibhava forms(incarnations). We shall take up the 95th pAsuram next. This entry was posted in iyaRpA, mudhal thiruvandhAdhi on September 13, 2017 by T N Krishnan.